The first colonists to settle Spanish Wells were shipwrecked on the reefs at Devils Backbone. They lived in a cave on Eleuthera that exists today as Preacher's Cave and later moved to Spanish Wells. Later, British Loyalists that left the Colonies after the Revolutionary War relocated there. The name Spanish Wells comes from the Spanish ships that stopped here to replenish their water supplies from the wells on the island. 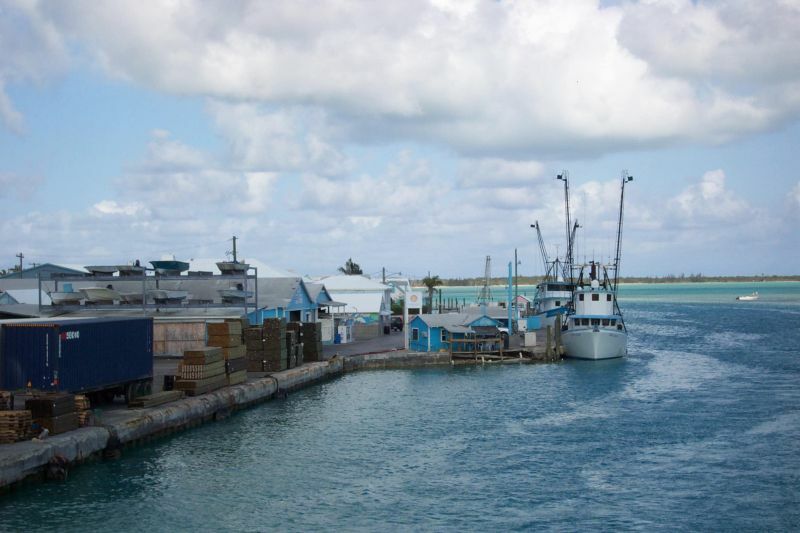 For us, this is one of our favorite ports of call in the Bahamas. Our planned 3-day stay before a good weather window turned out to be a much longer stay, after the window not only slammed shut, but bad weather set in. But that's okay, if this is where we would have to wait it out. There are two channels into Spanish Wells. One from the east and another from the south. After our transit of Current Cut, the wind started picking up in earnest. We headed directly for the south entrance to get in and secure as quickly as possible. The channel through the harbor is narrow but deep. Large island freighters and ferries come in and out of the harbor every day. There is only one small anchorage inside the harbor that can be exposed in southerly winds, so we opted for a slip at Spanish Wells Yacht Haven. We had stayed there many years ago and were placed in a slip right next to where we had stayed on Sea Trek. The streets of the settlement are lined with beautiful, well-cared for homes with manicured gardens and a golf cart parked in every driveway. Some of the homes date back hundreds of years and others are of new construction. Most any service needed by a boater can be found in the waterfront area. Marine supplies, mechanics and even a haul-out facility via a rail car are available. There is a nice grocery store, appliance shop, bakery and general merchandise stores located throughout the settlement. We found some very good and inexpensive restaurants also located on the waterfront. Backbone, but the captain seemed to know the route well. Even on the large ferry, the swells working over the reef made the ferry roll enough for us to hold on. The ride over takes about 30-45 minutes. 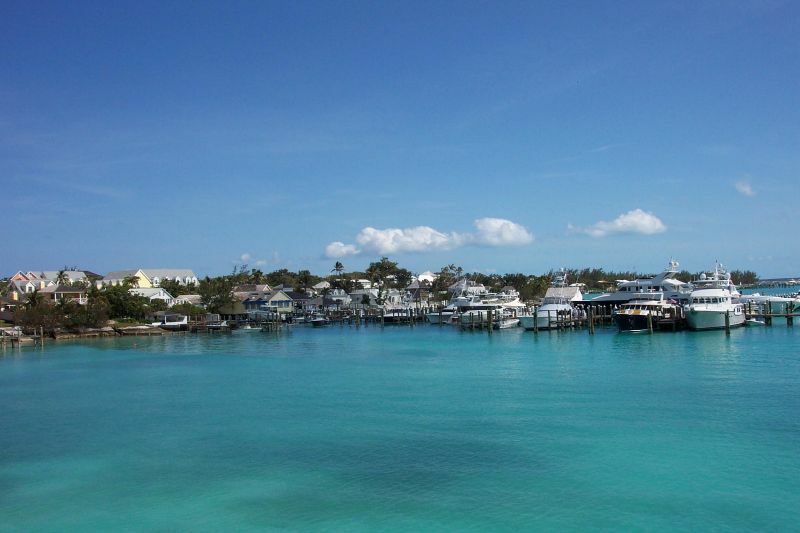 Harbour Island is a very upscale settlement with three large marinas, including resorts, homes on narrow tree-lined streets and many shops and restaurants. Maybe even a little too upscale for our taste. We stopped at a restaurant on the beach called Sip Sip. The least expensive item on the menu was a hot dog for $19.00. We decided to have a soft drink and move on to something more reasonably priced. We found a great snack shack (Seaview) right at the ferry dock with good food and good prices. It turned out to be where the locals eat. The owners were very friendly and the food plentiful. After a day of roaming around town and visiting the marinas and resorts, it was time to board the ferry and head back. The ferry has a large air-conditioned cabin with a snack bar and CNN on several large TV screens. But we were most interested in the route, since we would have to come part of the way when we decided to leave and cross over through the reef system. Most boaters hire a guide to bring them through. 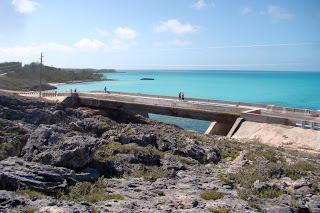 The next day we took a smaller government ferry over to Eleuthera and rented a car for the day. 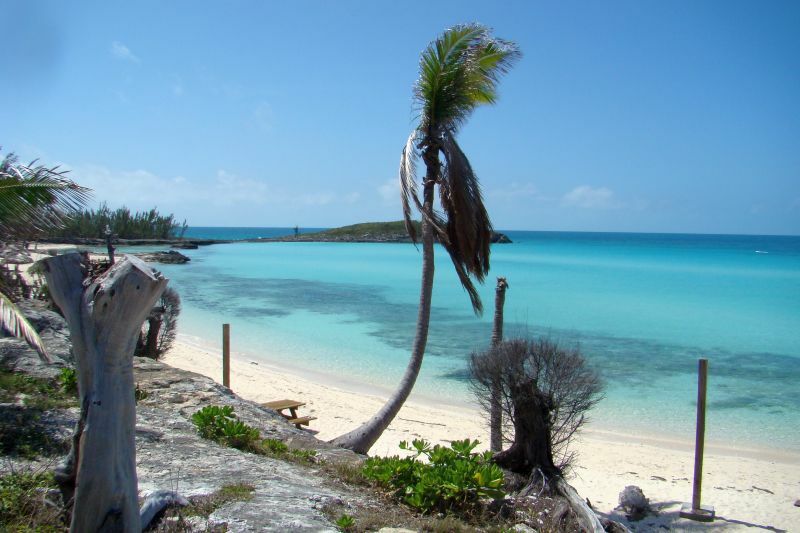 We split the cost with another couple that were in the slip next to us, and we planned to tour Eleuthera by land for a change. 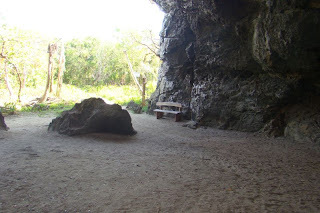 Our first stop was to see the Preacher's Cave, then we drove down to the Glass Window. 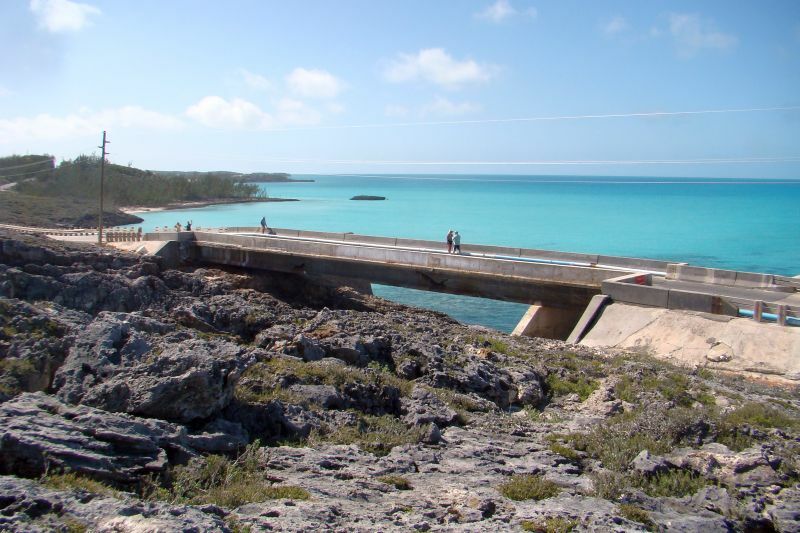 This bridge was hit by a storm in 1991 and shifted 7 feet to one side. It was repaired right where it landed and is in use today. You can see where it had been before the storm. We continued south and enjoyed the countryside along the way. The drive through Hatchet Bay, Rainbow Bay, Governors Harbour and South Palmetto Point was spectacular and the time passed too quickly. 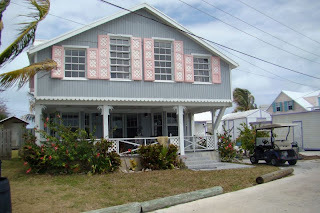 We had lunch at a funky restaurant in Governors Harbour that made the best burgers we have had in the Bahamas, but it wasn't cheap. We stopped at several beaches along the way to stroll and pick up shells and beach glass. 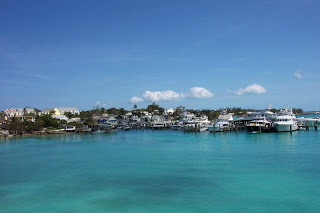 South Palmetto Point had been the anchorage we enjoyed near the Pineapple Cays the night before we moved to Spanish Wells. The day flew by and before we knew it, we had to turn around to give us enough time to get the rental car back and catch the last ferry. It turned out to be a terrific day. 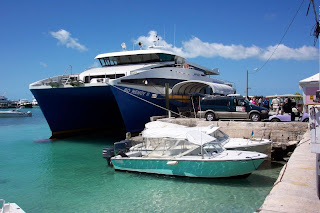 The ferry back to Spanish Wells was packed full when it arrived on the Eleuthera side, but we had it to ourselves riding the short distance back. The perfect end to a perfect day. So what will we do tomorrow? Though I did make a comment earlier (about Current Cut etc.) I neglected to say how much I do enjoy reading your blog. Have you seen the Swing Set blog? You may cross paths at some point, they were in Marsh Harbor Apr 28, their blog is also listed on the AGLCA website. Thanks Bruce. We actually met the Swing Set crew in Marathon. 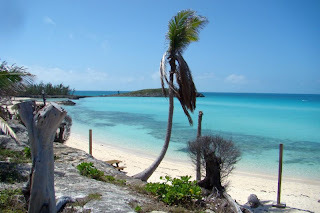 They are heading through the Abacos but going in the opposite direction that we are. Glad you enjoy the blog.